The Canada Goose was originally a native of North America. A few individuals manage to reach the UK naturally each year. However, the vast majority of the population dates from introductions. Historical records show that this was likely to have begun in the early 17th century, when a group of geese were presented to King Louis XIII in Paris. 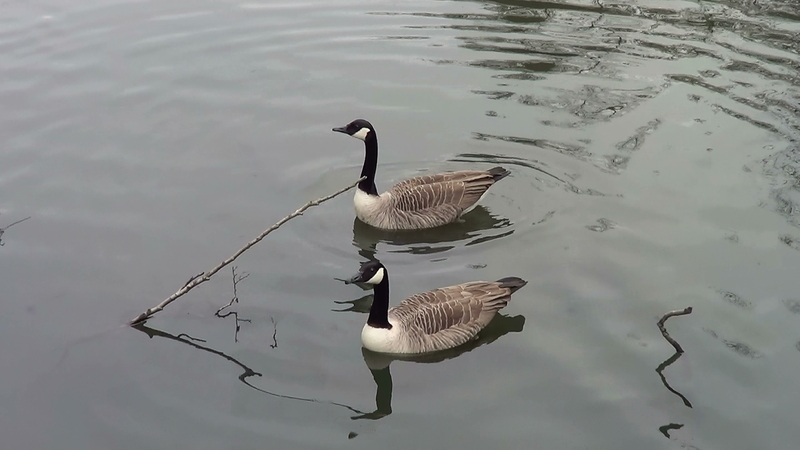 In the UK the first recorded introduction was in the late 17th century, when a group of Canada Geese were introduced into the Royal wildfowl collection in St James’s Park. From these small beginnings, it is estimated that the current UK breeding population is 62,000 pairs and the wintering population is around 190,000 birds. 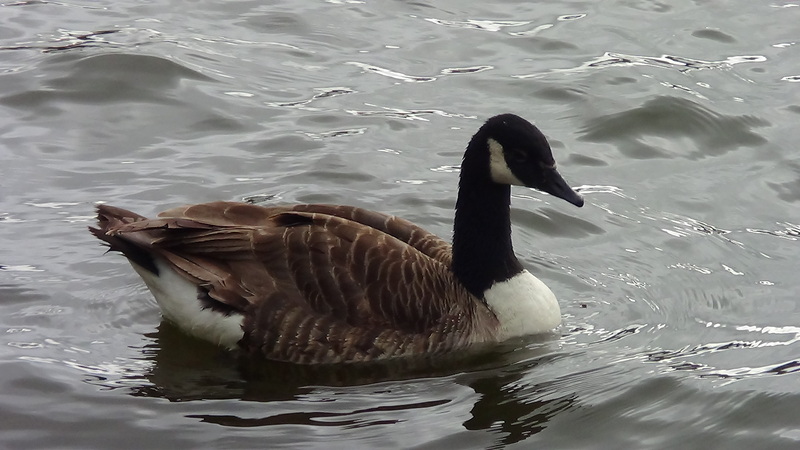 The Canada goose has become a common bird of UK lakes, gravel pits and urban parks. They usually form monogamous pairings which stay together until one bird dies. 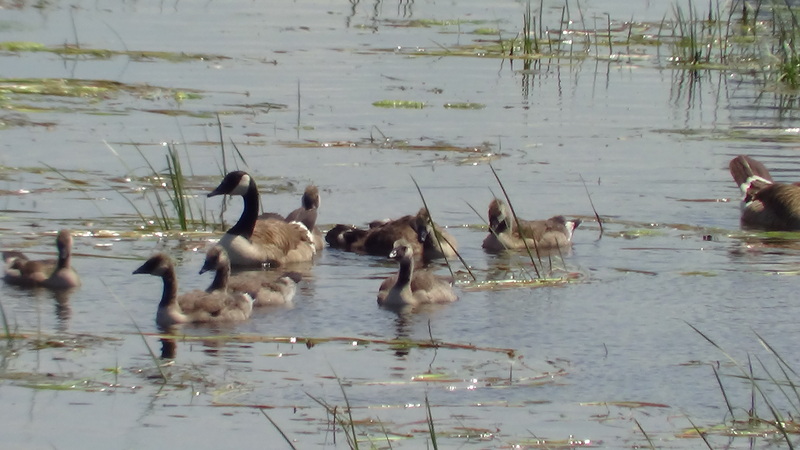 They can lay between 2-9 eggs per pair per year (average five) and it is not uncommon on our local lake to have 10 to 15 young every summer. 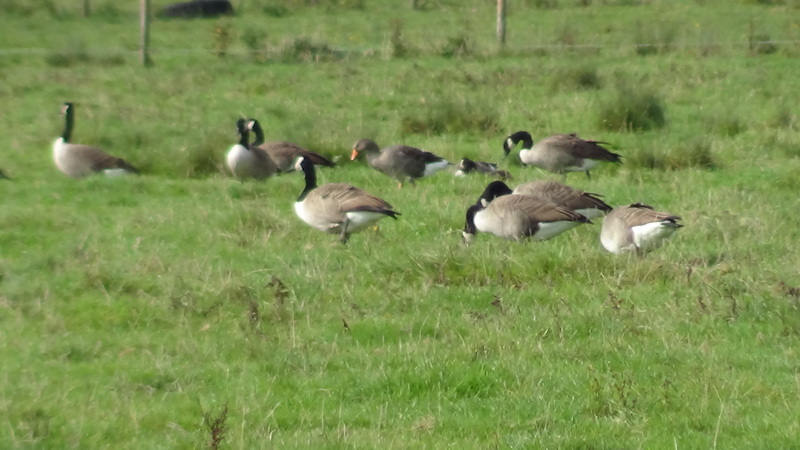 In the UK there are not many things that will take even a half grown Canada goose and so it is easy to see how their numbers prospered over the years. Indeed, in some places measures have had to be taken to limit their success and prevent them becoming a pest. Interestingly, the UK population unlike its American counterpart tends to be a resident species with very limited migration. I was pleased to hear our first Blackcap of the year singing in my garden a few evenings ago. The Blackcap is a small warbler, primarily a summer visitor is easily identifiable if seen. Both sexes are similar but the male, as its name suggests, has a black cap, whilst the female has a brown cap. It is estimated that around 1.2 million pairs breed in the UK and whilst most depart in the autumn, a growing number (currently estimated at around 3000 birds) now spend the winter here. However, research has shown that these are mostly birds that have bred in Germany or NE Europe rather than UK breeding birds. The Cirl Bunting is at the northernmost edge of its range in the UK and is found in the south-western counties. 10 years ago they were restricted to one or two isolated areas in Devon and it was feared that they may die out. The introduction of supplementary winter feeding programmes has boosted the number of birds that survive through the winter months and so are able to breed the next year and this has been responsible for a significant upturn in the population, such that they are now expanding into the neighbouring counties of Somerset and Cornwall. It is now estimated that there are around 900 breeding pairs in the UK. This medium-sized wading bird is a winter visitor to the UK. It is mostly found in the north of the country but although not common it has established winter roosts in the south at places such as Southsea Castle and Brixham Harbour. A few pairs (possibly up to 3) nest in the far northern islands of Scotland but it is estimated that the wintering population in the UK is around 13000 birds. They are usually found on rocky outcrops where they probe for winkles , crustaceans and spiders, although also eat the plants that grow on the rocks. These photos were all taken on our recent trip to Devon near Brixham Harbour. The final day of our trip to South Devon and Keith and I went to Berry Head Nature Reserve, which is on a headland just outside Brixham. Our first destination is the quarry, where for 200 years since the 1800s Limestone was quarried from the cliff. Today it provides a cliff face and a secluded place for birds. There are Fulmar nesting on the cliffs and out in the bay a large number of Northern Gannets and Guillemots. This looks a fantastic place for resting migrant birds, but only a few early migrants have arrived so far and apart from the resident species there is little to record. Our next destination is the bird hide which faces opposite the cliffs where the Guillemots nest. At this time, it is estimated that there are around 1000 birds on the cliff ledges. Our final stop on Berry Head is the point where we look for passing sea birds but only see more Guillemots and Gannets. We then began to descend from the headland vis the coast road, which passes through some woodland where we add some common woodland species to our day list, before coming to Breakwater Beach just outside Brixham Harbour. Just as we pass the outdoor swimming pool, I notice a small bird on the rocks, which turns out to be a Purple Sandpiper. We soon find another and spend some time watching and photographing this wading bird which spends most of its time probing in the gaps between rocks looking for food. Walking back through the harbour to the town, we see a Ruddy Turnstone on the quayside. That brings us to 107 species in 3 and a bit days birdwatching, the best we have achieved on any of our trips. Not only an excellent number of different species but some fantastic views as well. Fircrest tops the list for me as it is a species I have tried to find many times and failed so it was great to finally catch up with one. A visit to Exter Museum and a chance to see the only Great Black-headed Gull ever recorded in the UK. This bird which is a larger version of our Black-headed Gull breeds in an area stretching from Russia to Mongolia and winters in the Eastern Mediterranean, Arabia and India. This bird was reportedly seen on the Exe estuary in June 1859. Realising it was something unusual the observers shot it! This was standard practice in Victorian times before the advent of conservation and photography. The specimen was eventually sent to the British Museum for identification and was displayed there. When the owner died his collection passed to the museum in Exeter and the Gull returned there where it can still be seen on display. There is much doubt over such Victorian records. You only need look at cases such as the Hastings Rarities, where many exotic birds were claimed to have been seen in the locality but which have since been shown to be improbable and have been removed from the list of species recorded in the UK. However, there have been a number of records of Great Black-headed Gulls in Scandinavia and Holland over the years and the majority of these have occurred in May and June. In 1993, this record was re-examined by the British Records Committee who found there was no reason to disbelieve it was a genuine record. So although there has been no further confirmed record in the UK for 160 years it may turn up again one day. Keith and I headed off to Exeter today to look around the city. However the train travels along the River Teign, the coast and the Exe estuary before it reaches the city, so a chance to see some birds on the way. Large numbers of Redshank, Black-tailed Godwits, Dunlin and Oystercatchers are present plus Shelduck, Cormorants and Gulls. On our arrival, our first stop is a local Church to see the Peregrines which roost there. we are fortunate and both are sitting out on the steeple before the male flies off. On the way back to our base in Brixham, I see a Little Grebe on the River Exe in the city and 12 Brent Geese on the Exe estuary to add to the species seen on our trip. Our second day in South Devon and we are out again with local naturalist and artist, Mike Langman. Our first stop is Broadsands Bay where Mike has been providing Supplementary feeding during the Winter. This project is aimed at helping the local speciality species Cirl Bunting survive through the winter. This species had declined so much that only a handful of pairs remained in a couple of spots in Devon. Since the beginning of supplementary winter feeding programme began at a number of sites throughout South Devon the number of birds has risen dramatically and the species is now expanding out from its traditional area into surrounding counties. We get excellent views of Cirl Buntings and Yellowhammers. Moving on from Broadsands, we drive to Dartington in search of Dipper. Parking up we walk the stretch of river which is an established territory and had a couple of flight views before we eventually found a bird collecting leaves for its nest. Travelling South we moved onto Slapton Ley, a freshwater lake adjacent to the sea. We soon located a Ring-necked Duck, a visitor from North America, a number of whom have crossed the Atlantic Ocean at the beginning of the winter. On the sea is a Black-necked Grebe. Continuing our journey south we come to Beeson Ley, but there are only a few ducks. On the sea here though are a flock of 25 Common Scoter. Turning north we stop at a wood just outside Dartmouth, where we locate a male Firecrest. Excellent views but this hyper-active bird will not stay in one place to be photographed. After Mike dropped us off in Brixham, Keith and I walked out to the end of the harbour breakwater. We were rewarded with sightings of 1 or 2 Seals plus a pod of 6 Dolphins (probably Bottlenosed) plus the amazing sight of over 100 Pied Wagtails coming into roost on the boats in the harbour. A second excellent day. Our thanks to Mike for sharing his local knowledge and transporting us around. Keith and I in South Devon for a few days birdwatching and today we are out with local Naturalist and artist Mike Langman. Our first stop is Yarner Woods on the edge of Dartmoor in search of Lesser Spotted Woodpecker. We see a number of different woodland species before we hear one drumming. Heading towards the sound we eventually locate the area and see the bird as it flies away. It is so small it looks like a pair of wings with no body! Moving on we locate another drumming male and locate it high on a tree. We get some brief views before it too flies off. We hear another drumming but are unable to locate it. From here we move onto the side of a valley to look for Goshawks. Mike gets a brief view but Keith and I cannot get onto it before it disappears. That proves to be our only sighting and we move onto crossing the River Exe to Aylesbeare Common in search of Dartford Warbler. We are very fortunate and before very long we locate an area where 3-4 Dartford Warblers are disputing territories and chasing each other around. We also have good views of Stonechat and 3 Ravens which flew over the common. Our next stop is Powderham where a Yellow-Browed Warbler has been over-wintering but no sign. There were a number of YBW over-wintering in Devon, but a brief cold spell a couple of weeks ago seems to have moved them on (as it has for the two I saw in Dorset in January). A brief stop at Starcross follows and we quickly locate the wintering Slavonian (Horned) Grebe which has been wintering in the area. Our final stop of the day is the RSPB reserve at Bowling Green Marsh on the edge of the River Exe. There were a large number of Pintail (around 100) and Wigeon (c50) as well as other ducks. Leaving the Marsh we continued to the riverside and on the mud were Black-tailed Godwit, Dunlin, Grey Plover and Curlew. Also present were 3 Goldeneye.